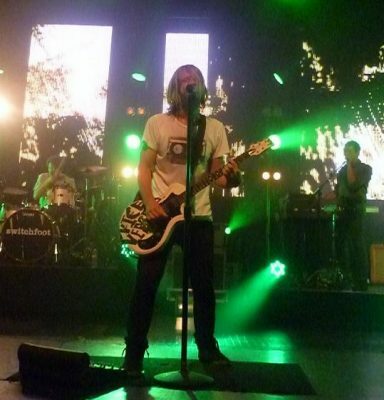 There’s something unique about Switchfoot. As a result, their fans have a different vibe than those belonging to your average rock band, and so their shows have a different feel to them than most I find myself attending. 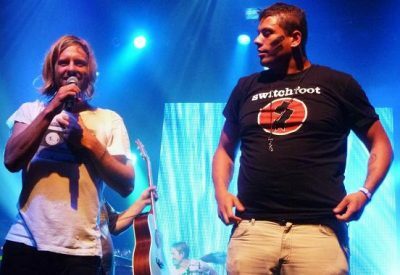 Sure, some consider Switchfoot a “Christian band,” but it’s not quite that simple. Yes, the members themselves are Christians. Yes, much of their lyrical content has spiritual undertones, and no they don’t try to hide it. But truth be told, I’m not sure I’d give them much of a second listen if they were the kind of band marketed solely to “Christian rock” radio. That just isn’t my thing. (Not that there’s anything wrong with that…) Because these guys prefer to live their lives as good, salt-of-the-earth people with a great sound and steer far clear of anything that might feel like they’re pimping their beliefs on me, I’ve been hooked for over a decade. But it’s more than that… There’s honestly a kind of “live and let live” mantra between the band and its fans: as long as you respect what I believe, I can do the same for you and we can all get along and enjoy each other. And that’s the sort of breath of fresh air that inspires me at a Switchfoot show, and what keeps me coming back. This week, they played San Francisco’s tiny Regency Ballroom Tuesday night, alongside Nashville indie rock band Paper Route, and before the night began, I was full of anticipation and excitement for a night of music by the band whose music has been something of a soundtrack for the last decade of my life. Paper Route was new to me. When they took their places onstage, I had only the expectations of a fan who wants to see the headliner (but who’s heard that the opener is enjoyable). 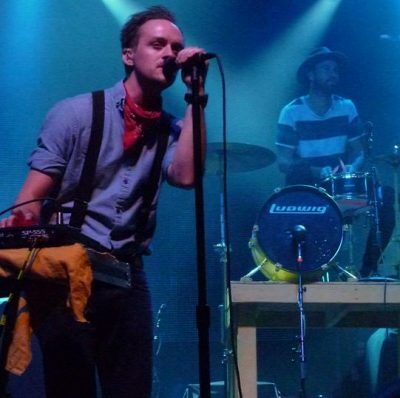 I liked J.T.’s style right away, as he was clad in suspenders, a bandanna tied around his neck, clutching a tambourine. Their set opened with “Love Letters,” followed by “Wish.” Before “Two Hearts,” J.T. mentioned that it was a love song, asking the crowd to “raise your hand if you’re in love tonight, San Francisco!” I couldn’t help but smile, nostalgic for the days when I was asked to “raise my hand if,” rather than to “wooo!! !” in answer. “Are We All Forgotten” came next, and was a stand-out song for me of the set. After “Enemy Among Us” (for which the drummer performed on a tiny drum set on an elevated platform, before returning back to his regular drum kit), J.T. said that the “next one goes out to the Giants and 49ers!” The song, “Gutter,” had three band members playing percussion of some sort: drummer Gavin on his kit, J.T. playing the tiny drum set, and keys man Chad also pounding away at a drum machine next to the keyboard. After the rocking “Rabbit Holes,” J.T. explained that the band’s newest album, The Peace of Wild Things, was “the most honest album we’ve ever made,” and that they’d asked a lot of hard questions and been through a lot, “like in this next song, which is about hurt.” The song, “Letting You Let Go,” was sad and wonderful, and the reason I later downloaded this album. Next came the band’s current single, “You and I,” which J.T. asked the crowd to watch on YouTube. Their last song, “Dance on Our Graves,” was the only indication I got that Paper Route, like Switchfoot, believes in a higher power, and some kind of life after death. The song is haunting, beautiful, and somehow felt a bit fitting as Halloween draws nigh. It’s full of pretty organ chords and ends with lyrics alluded to in its title, about an afterlife of singing glory and hallelujah, and indeed dancing on their own graves. Again I must assert here that normally, I’d skip right past this sort of thing. I’m really sensitive to anyone’s “religiousness” that I feel they’re trying to push on me, and like Switchfoot, I didn’t feel this was the case at all in Paper Route’s music, which was one reason I thoroughly enjoyed them. When Switchfoot took the stage later, I quickly realized I’d forgotten the level of noise that comes from their audiences: last time I saw them, it completely took me by surprise! The show began with “Mess of Me,” and then a quick hello from frontman Jonathan Foreman, who called the band our “neighbors from the south” (San Diego, to be exact). “Stars” was up next, and I couldn’t help but laugh to see Jon scream back at the raucous crowd. After “The War Inside” came old favorite “Meant to Live,” during which Jon leaned over the front rows of the audience for the final chorus. The oldie-but-goodie “This is Your Life” followed, after which Jon explained that he was from California too, saying, “I was born here, I live here… I pay taxes here. Can I join you?” before promptly jumping into the crowd among the fans for “The Original.” After safely being returned to the stage, Foreman explained that he wanted to upset the song list for the evening, dedicating the next song “to Elvis and his mom,” which was met with a cheer. The song, “Gone,” found him standing on the drums as Chad pounded away. “And that’s why I love San Francisco,” Jon proclaimed, saying that the crowd sounded better than he did, asking us if we wanted to start the next song for him. “Restless” began with just the beat of Chad’s drums and the voices of the fans, and when it had finished, Jon asked everyone to give “loud amazing appreciation” to Paper Route. “More than that,” he insisted, calling it “such an honor to have them out with us.” Next he asked for love and appreciation for his “little bro Tim” on bass, and then Jerome on keys, Chad on the drums, and a “man with real facial hair,” Drew on guitar. He then pointed out that he intended to play “a real harmonica” for the next song, “Your Love is a Song.” Older hit “Dare You to Move” followed, after which Jon explained, “as a musician it’s an honor to hear that our songs have impacted you guys. I can’t think of a bigger honor than to think that something I wrote in my bedroom trying to figure out my own issues affected someone in San Francisco.” He went on to say that there had been a kid playing Switchfoot songs on his acoustic guitar on the venue’s street corner that afternoon. I’d heard the same story, and more importantly, when Jon had been told about it, he gave the guy a ticket. As it turned out, he was the tall man standing just in front of me all night whose arms had been photo-bombing some of my best shots. (Suddenly I was much more forgiving!) Even cooler, Jon invited him to join the band on stage, handed him his guitar, and asked him to play out the song for him. That’s my kind of band. The next song was “Dark Horses,” and when it was over, the band immediately exited the stage, returning quickly to play “The Sound (John M. Perkins’ Blues”), after which Foreman asked, “can we play one more for you on a Tuesday night, San Francisco?” Naturally, I wasn’t the only one happy to stick around a bit longer. “We’re making a movie about surfing, music, and the past eight years,” Jon explained before they began “Where I Belong” with the crowd singing the “oh oh oh”s without being encouraged to. As all the band members stepped back from their microphones, it was just the sound of the crowd singing with the instrumentals of Switchfoot. As the show concluded, I couldn’t help but feel that, religious or not, a Switchfoot show is a place I’ll always be happy to belong.